Facebook users will now have an easier time meeting up with friends at social events or planning group activities using the social network's new Nearby Friends feature, an opt-in service that alerts friends when they are close to each other. With Nearby Friends enabled, users will receive a home screen notification telling them which friends are around their area. Users can then drill down to see roughly how far away those friends are and how recently their location was updated. Another feature allows users to broadcast their exact location, in a manner similar to Apple's Find my Friends app. Users can select a set of friends and instruct Facebook to allow those friends to pinpoint the user on a map for a specific period of time. Facebook says the service is completely optional, allowing those who prefer privacy to keep their location a secret. The setting is somewhat granular, so users can also allow only certain friends —for example, a spouse —to know where they are. 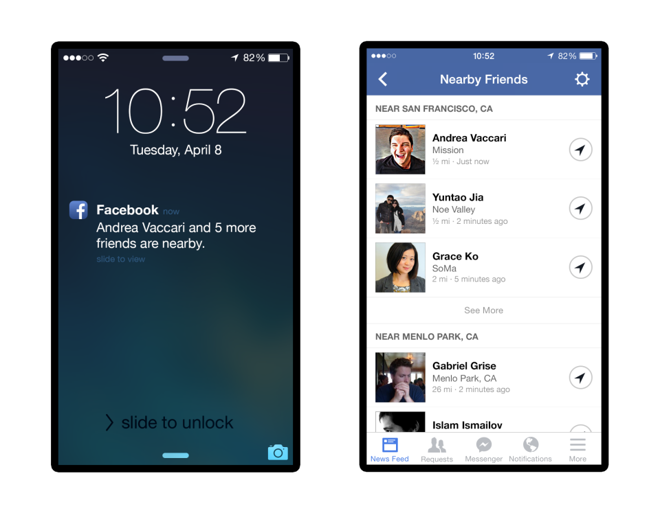 Nearby Friends will debut on both iOS and Android "in the US over the coming weeks." There is no word on when Facebook might expand the functionality internationally.